Having had something of a re-conversion to the joys of woodworking, I thought I should get hold of an old favourite jointing tool, the Joint-Genie, as many of you new woodworkers out there won't have tried it out. At first sight out of the box, the thing looks simple, sturdy, and fairly self-explanatory. 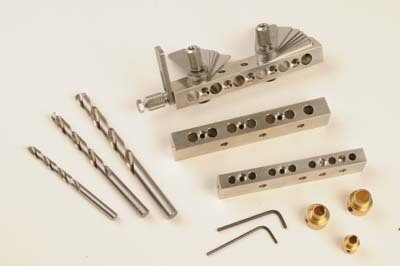 You have the main body of the jig, with its side and end tabs, which tighten up easily with well-machined knurled knobs and spring washers. 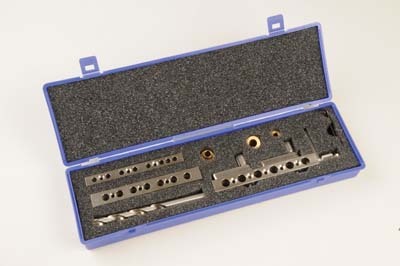 There are three jig and appropriate HSS drill sizes in the kit: 10, 8 and 6mm. Each drill comes with its own brass depth stop, which screws tight with an Allen key and grub screw. The jig bodies are made of nickel plated hardened steel and the edge tabs, which come in varying thicknesses, are made of stainless steel. As Joint-Genie say, the thing is built to last a lifetime. So, to cutting a joint, and really it's a dream. You use the end and face tabs to centre the correct size jig on the workpiece. Then using the supplied turbo screws, fix the bar to the workpiece, obviously using the jig screw holes that will be hidden by the joint. Set the drill depth stop and simply use the jig to locate the drill on the workpiece and off you go. 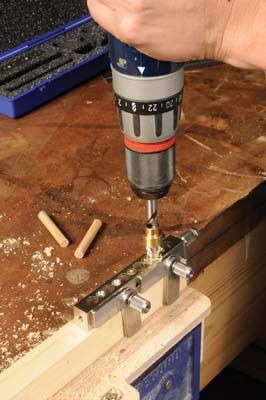 The jig itself provides enough of a guide to keep the drill upright. 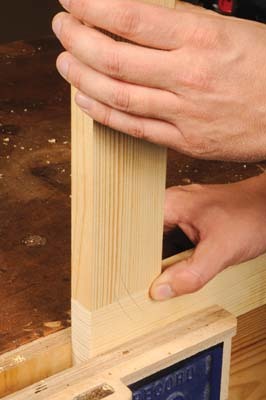 Then simply detach the jig, and being careful to work off the same face as the first end of the joint, drill the dowel holes in the other half of your joint. The kit is very versatile, and more or less anywhere you can create a dowel joint, the Genie can help you - whether it be mitred joints, T-joints, end-to-end joints or corner joints - as we created in our test. Without even reading the instructions, I set up and cut a perfect corner joint in minutes, which fitted together perfectly. This really is a very handy jig, and anyone who uses dowel joints should get one.